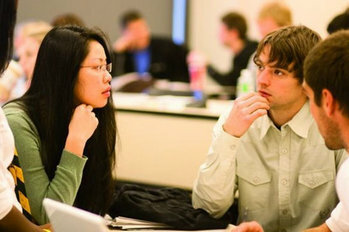 Studying abroad has grown into a general trend in China. The Ministry of Education says more than 459,000 Chinese left the country to study abroad last year, an increase of 11 percent from 2013. Thousands of Chinese students in pursuit of overseas education have helped drive up international enrolments at colleges in America and Europe. The trend of studying abroad is taking deeper root in China. Nearly 2,000 students have signed up for the first round of this year's Secondary School Admission Test, an entrance examination to secondary school in the United States. That's a 30% year-on-year increase and also an obvious reflection that overseas study candidates are getting younger and younger. The number of teenage overseas students hit a peak in 2014, with up to 30 percent of Chinese students going abroad for high school education. "According to our estimation, there will be continuing growth this year for Chinese students to go to private high school in the US," said Chen Huqiong, expert at overseas study agent. "Australia fully opened to the world its teenage study programs last year. That means Chinese students could go to there for junior high school studies after they finish primary school. The number of teenage overseas students in Australia will be experiencing explosive growth in 2015," said Tian Litie, overseas study agent expert. A dramatic drop in the exchange rates for RMB against the euro and the pound has helped spur the market in Europe. The euro slid to a 13-year low against the dollar in January, which has been welcomed by students who are planning to study in the Eurozone. "Taking two tuition-free countries, Germany and Italy, for example, as the euro slides, the living expenses of students will be reduced to 40,000 from 50,000 yuan," said overseas study agent expert Liu Wei. The overseas study markets are also blooming in East Asia, as China and South Korea initialled a bilateral trade pact in February after a three-month negotiation. Under the accord, China and South Korea will eliminate tariffs on more than 90 percent of all products imported from each other within 20 years after the implementation of Free Tradev Agreement.